The final whistle is gone and it’s Algeria 2 – 2 Ivory Coast. That will be the last action. The final whistle blows, Ivory Coast get themselves out of jail after fighting back for a 2-2 draw against Algeria. Algeria looked home and dry, but it’s all square once again after an impressive comeback from their opponents. Spirit of champions, could one say rather mischeviously? Emmanuel Eboue has only just entered the game, but he is down in a heap after clashing with Soudani. The game waits for the full-back to come off for treatment. 86″ Slimani had a wonderful chance to make it 3-2 after more poor marking from the Elephants, but he completely fluffs a first-time effort. 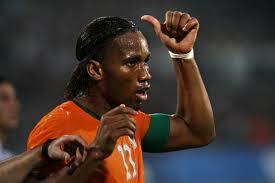 77″ Goal by Didier Drogba. A goal which suddenly appears on the end of a cross and powers his header down.